Unity Skatepark is on the brink of completion! Read about the people behind its construction. 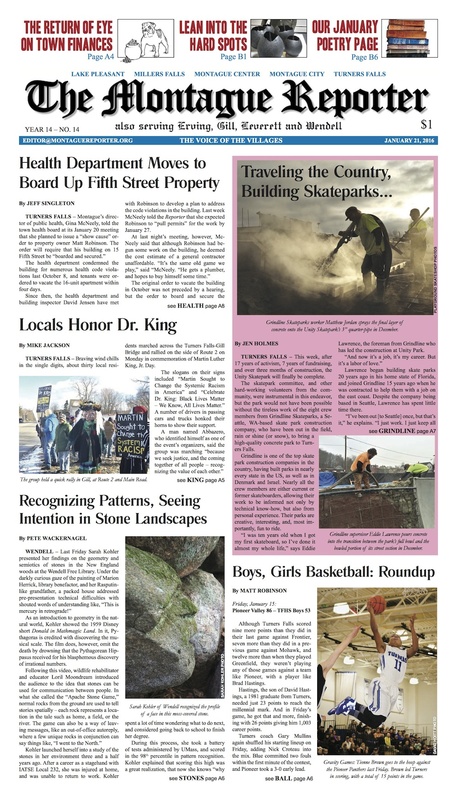 Also on page 1: the latest on 15 Fifth Street, along with other news from the Montague Health Board; local residents brave the cold to commemorate Martin Luther King, Jr. Day; and even Mercury in retrograde can’t stop a crowd from learning about the semiotics of stones at the Wendell Free Library. On our editorial page: an analysis of the 108 responses to our year-end survey (thank you to all who responded!). A member of Montague’s Finance Committee offers some insights into the committee’s work. Our guest editorialist follows the flow of money from Comcast to MCCI. Plus: notes from the Wendell Selectboard; nomination papers and absentee ballots now available in Montague; and a TFHS boys and girls basketball roundup. MoRe: A look the ideas, forms, and materials at play in local artist Fafnir Adamites’ striking sculptures. The latest installment from Jinx sees the family move to The Hill. The Gardener’s Companion sends a dispatch from sunny Florida. 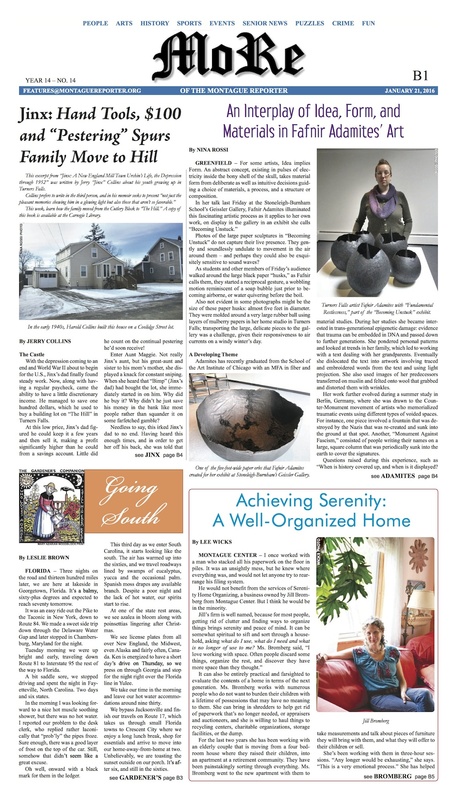 A Montague resident helps people find serenity in well-organized homes. Experience rare views of the North Quabbin at Wendell Free Library. Plus: Modern Voids; the FCTS honor roll; highlights from the Montague Police Log; Healthy Geezer; Pet of the Week; MCTV listings; and the return of the Poetry Page.